Tony Chisnall recently joined Schiphol’s Capital Programme in order to help make a difference here in the Netherlands. Tony hails from the United Kingdom, and is now in a position to reflect on his first few months at Schiphol – even though he prefers to keep his gaze firmly forward. “I am here to achieve the best for our airport, today”, he said. Tony’s enthusiasm for Schiphol is obvious as soon as he starts talking. “This is the best job I’ve ever had”, he said. He didn’t hesitate to move to the Netherlands from his home country, despite having worked away abroad before – even though he had to leave behind St. Helens, his favourite rugby team. “I had the chance to join the world’s most respected airport hub, so it’s almost as if I jumped on a plane right away”. As the airport embarks upon wide-scale construction of the new pier and terminal, he always tries to look beyond his particular role to see the bigger picture. “It’s not simply about erecting a building”, said Tony. “I want to see real operating outcomes and new facilities that represent us – our pier, and our terminal. That only works if everything comes together, from retail to security and operations – and most importantly, people. I will only feel proud when everyone and everything comes together as one team”. 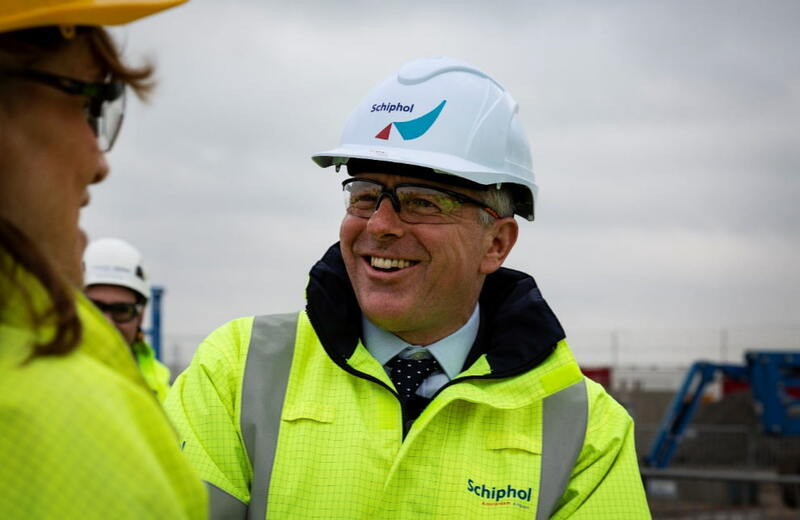 It has been a long time since Schiphol embarked upon a construction project of this size and scale, and Tony admits that the challenge ahead is considerable. “We are in the midst of creating spaces that millions of people will visit each year, which makes it a great challenge. It’s one that Schiphol can handle, but only if we have the right people making the right decisions at the right time. Tony took over the reigns of the Capital Programme from his predecessor, Bernardo Gogna. Some things will continue in the same way, and others will change. For example, I believe Schiphol sometimes errs on the side of caution when it comes to making plans for the future. We really have to recognise how the world see us – as a leader. So we must be proud of what we do, and not be afraid to embrace new perspectives and new ways of working”. Tony delivered impressive results for international organisations before joining Schiphol. For instance, he developed a new operational business model for the British Ministry of Defense. “That was a huge change process”, he explained. He spent 6 years working on a massive investment programme to build a new terminal in Abu Dhabi, a job that is seemingly the most similar to Schiphol. “For me, the fact that Abu Dhabi was another airport doesn’t matter that much. My goal is to help companies perform optimally and make smart investments. I did that in the Middle East, and I’ll be doing that now here in Europe”. Tony has a life motto that certainly applies to the future of the new pier and terminal – ‘stick with it, and deliver it”. Tony said: “I hope to leave behind something unique. By that, I mean not just a great building, but also a great team that can do much more for the future of this airport. I’d like that be my legacy”. Tony said that he already feels quite attached to his new life in the Netherlands. “I usually return to the U.K. through Heathrow. The Netherlands and Schiphol are both smaller in scale. Both the country and the airport feel warmer, which is a feeling I haven’t often encountered. There is help and courtesy everywhere, and I think that’s what our customers want”.